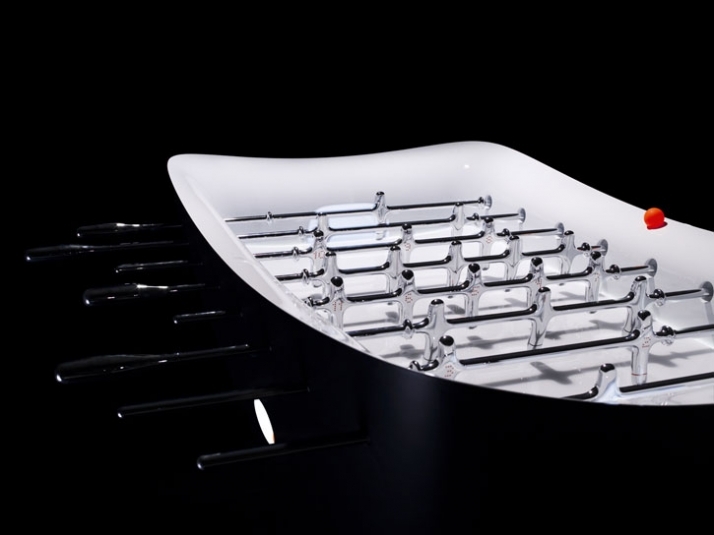 A football table designed by GRO design and developed by TIM model makers. 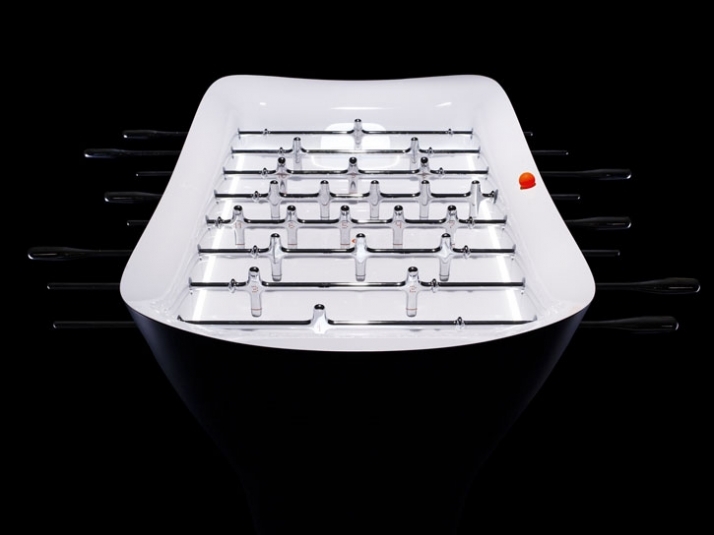 For many of us, table football is a game that is close to our hearts, holding cherished memories of our childhood and youth. Its popularity also reflects the passion and love that millions of people around the world share for 'the beautiful game' of football. 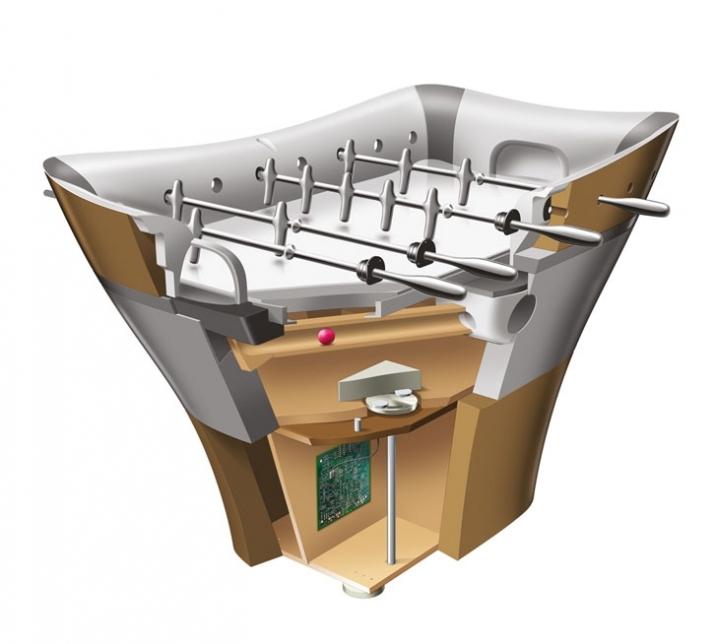 Table football is great fun to play – it’s social, active and physical, and it offers a welcome alternative to the solitary activity of computer gaming. As an object, however, it has become less desirable as its often cost-driven appearance no longer fits in with the designed landscape of modern interiors – be it a café, bar or airport lounge. 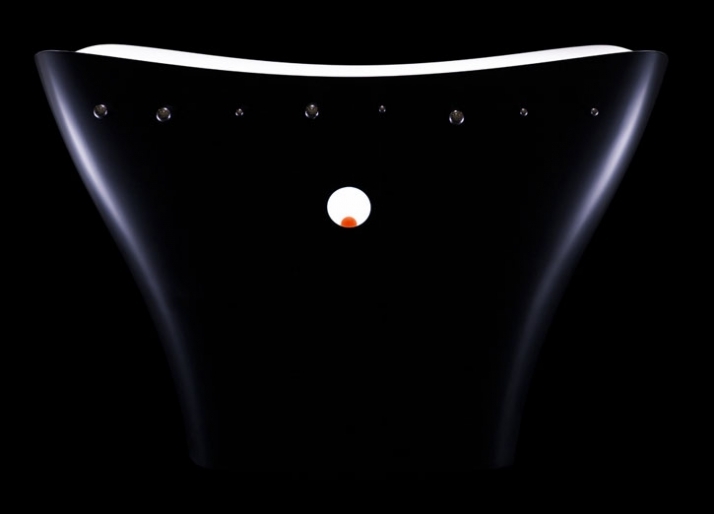 Milan Design Fair // When thinking about a project for the Milan Design Fair, we looked for an object that we believed we could enhance through design, and that had lacked serious design attention in recent years. 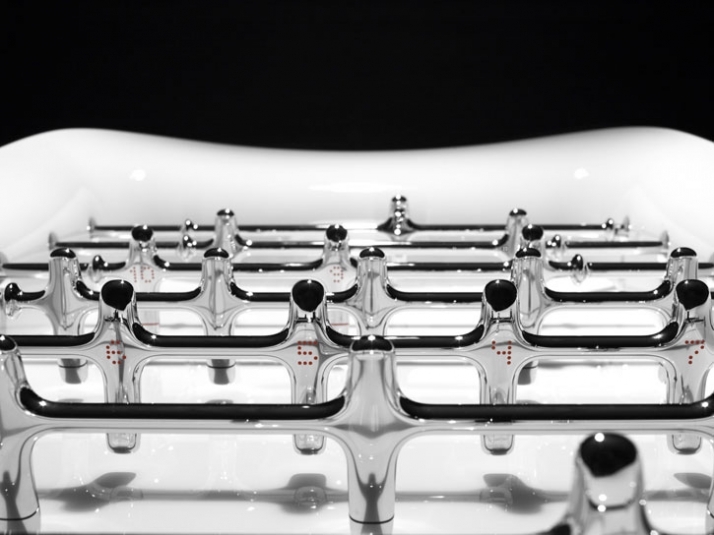 After considering a number of starting points, we felt that the football table would have the right elements involved to show our commitment to the highest level of quality in design and model making. Discussing “11” together, we knew it would be a challenge to take on. Architectural beauty // Many new football stadiums built in recent years have a strong architectural and sculptural beauty, becoming city landmarks in their own right and enhancing the visual landscape of the local environment. We wanted the design of our football table to be equally spectacular and memorable, enriching the interior space where it will be placed. Design choices // We were interested in creating atmosphere through form, colour, material and subtle use of light, bringing a heightened sense of drama and excitement to the game. 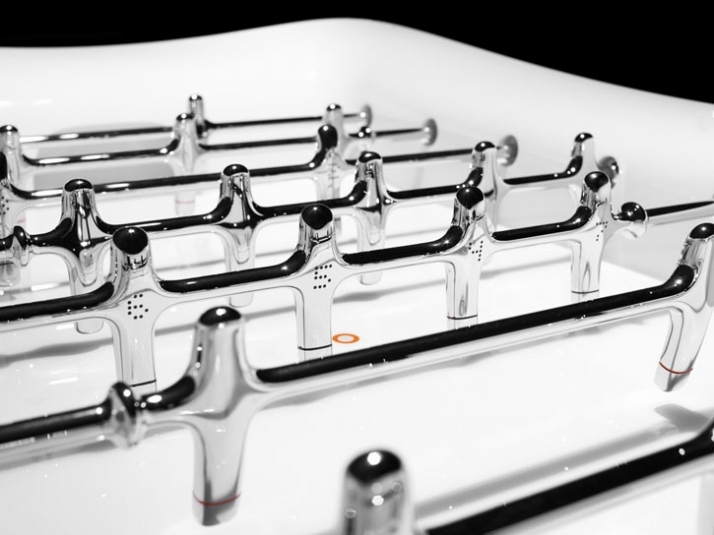 The table’s flowing lines express the dynamic aspect of football, while reducing unnecessary detail to allow the raw energy of the game to come to the fore. The illuminated interior, contrasting with the dark exterior, draws the players and bystanders into the action. Adding light truly makes the spectacle come alive, as all the attention is directed toward the figures and the ball. As well as ensuring visual impact and consistency of design, the bright-silver chrome finish of the figures mirrors footballers’ status in sport and society. 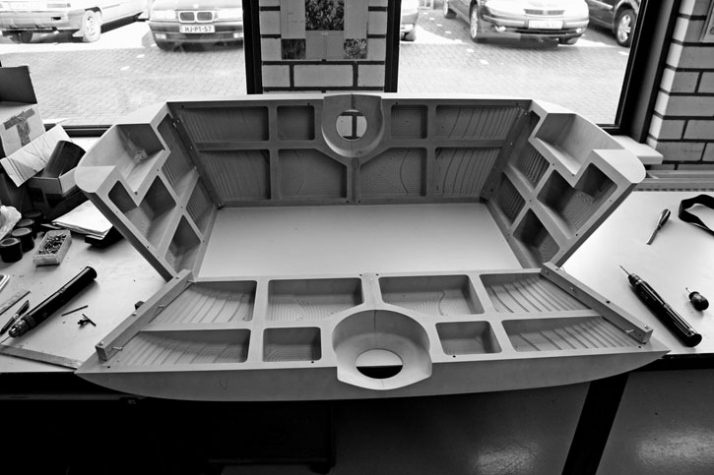 Model making choices // In order to make a model of this scale, planning and model making strategy were critical. From the outset, careful consideration was given to picking the right model making techniques to achieve the best possible visual results, while maintaining playing quality, stability and ease of assembly. The lines of players proved challenging. Machined from solid brass, the weight of each rod required the right bearing mechanism to allow the rods to rotate smoothly. Finished in bright-silver chrome required hours of polishing to achieve a perfect mirror finish, before finally ink filling the graphic details. 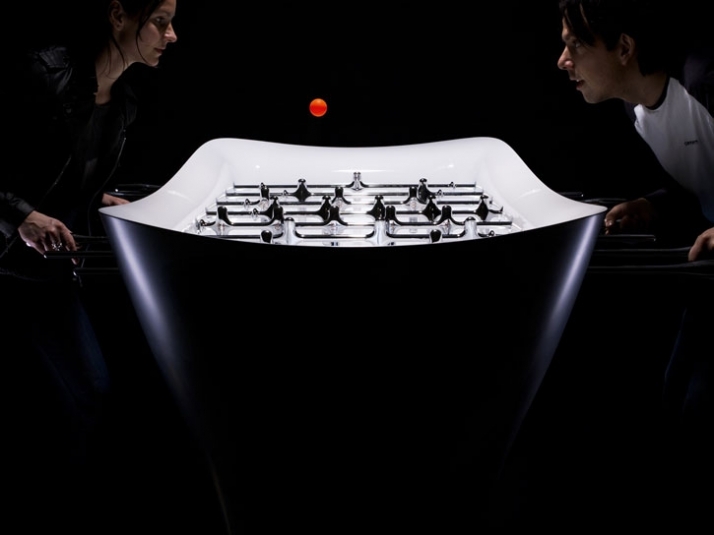 The model of the football table incorporates a number of lighting effects. This required not only finding the best lighting solution, but also writing software to enhance the experience of playing the game – showing the winning goal or restarting the game. Machining and polishing 22 players to a bright-silver chrome finish, incorporating working electronics and applying unique ink-filling techniques were just a few of the many challenges that required expertise and intense teamwork. Working together // 11 – the beautiful game is a collaboration of two companies – GRO design and Tim model makers – each one contributing their world-class specialist skills to this showcase project. 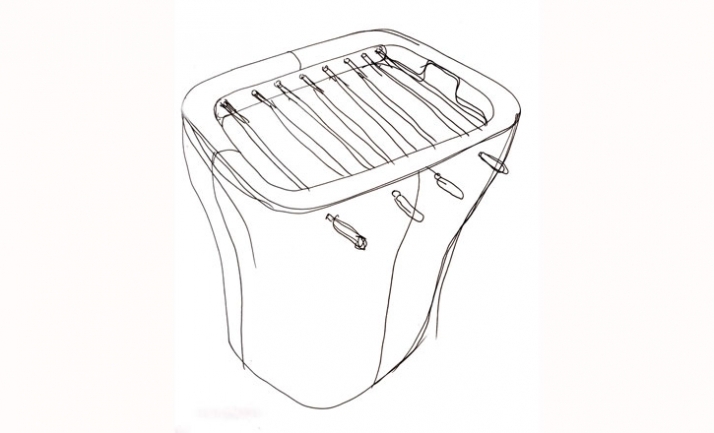 With their shared values of creativity, quality and experience, the two companies have worked together for over fifteen years on projects ranging from consumer electronics and domestic appliances to lighting and furniture. This relationship has resulted in an implicit trust in each other’s expertise and intuition, as well as a shared commitment to go the extra mile to achieve the best possible results for their clients. Joining forces between GRO and TIM does not only enrich the end-result but is essential in visualizing strong design ideas through convincing and exciting models. In 2006 GRO and TIM presented the acclaimed project ‘scoot’, an electric scooter, at the Milan Design Week.